Ganesha Chaturthi is the Hindu festival celebrated in honor of the Lord Ganesha. This Year Ganesh Chaturthi starts on 13th August, 2017 and will lasts for 10 days. This festival also known as ‘Vinayak Chaturthi’ or ‘Vinayaka Chavithi’ in other regions of India. 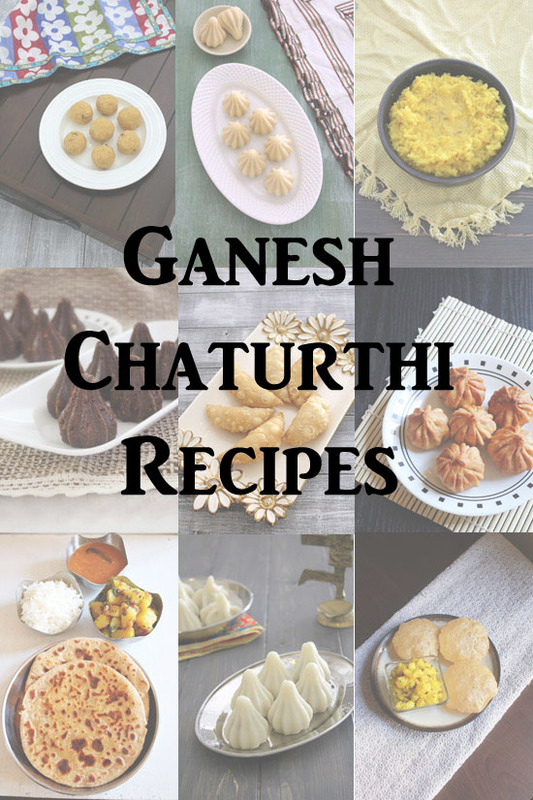 Here I am sharing the list of sweets and savories Maharashtrian Ganesh Chaturthi recipes from the blog. All recipes have step by step photo instructions. Modak is Lord Ganesha’s most favorite food. Hence it has special importance in worship. Traditionally, modak has sweet stuffing made from coconut and jaggery. There are many variations and nowadays there are many fusion versions are also made. 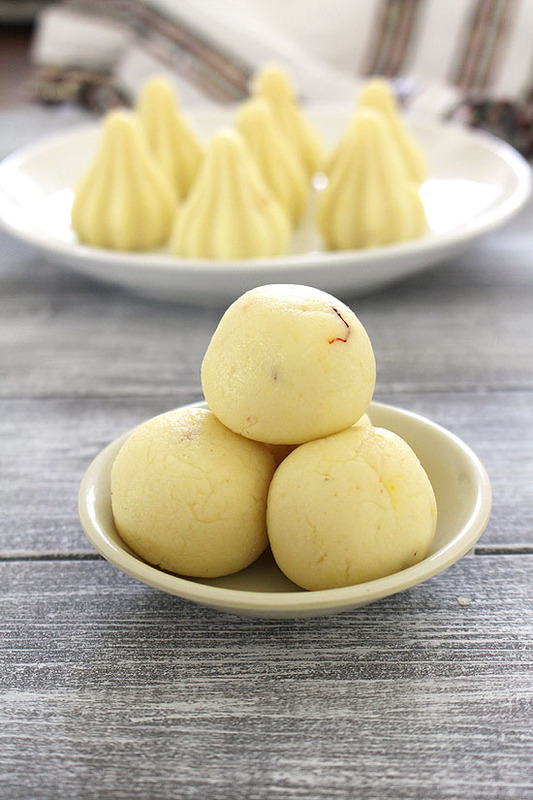 Below is the list of modak recipes from the blog. 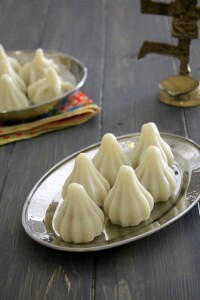 1) Ukadiche modak – Steamed modak, The outer covering is made from rice flour and stuffing is made from coconut-Jaggery. 2) Fried Modak – it is deep fried or shallow fried modak recipe with sweet, chewy coconut stuffing and very crispy outside covering. 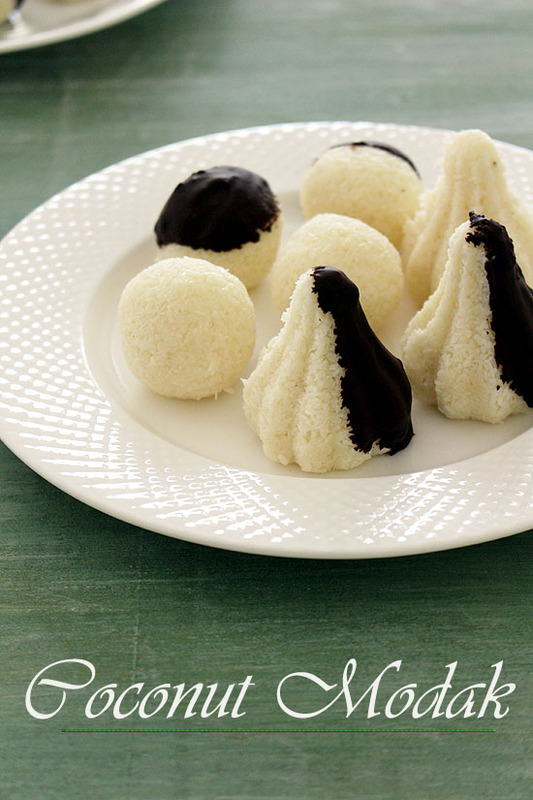 3) Chocolate Modak – Fusion version of making modak. 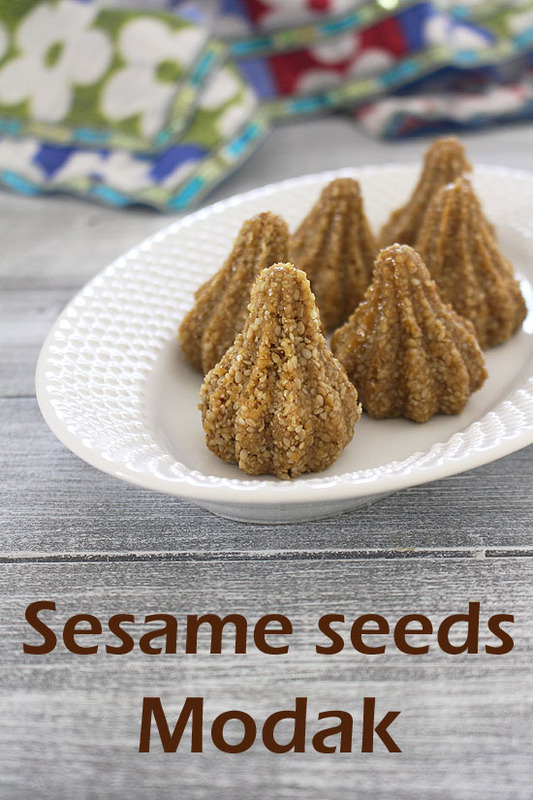 It is made from semi sweet chocolate chips, sweetened condensed milk and biscuit crumbs. 5) Mawa modak – It is made from khoya or mawa and stuffed with figs, dry coconut and nuts. 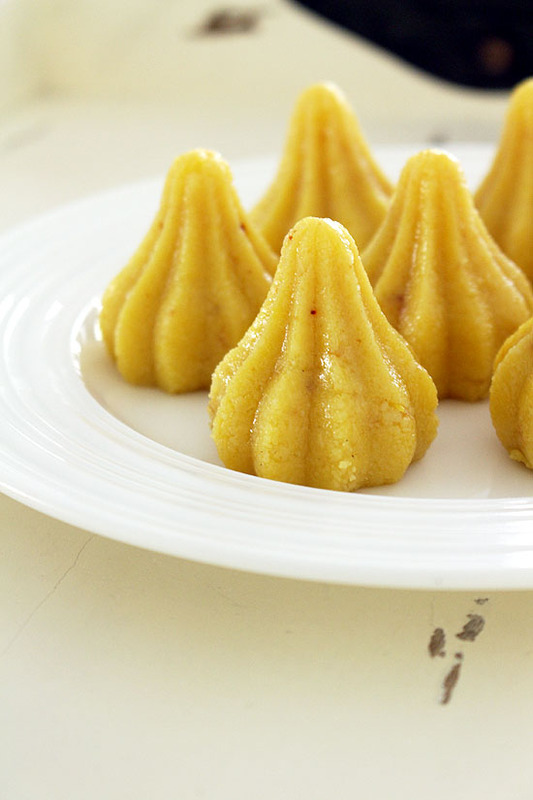 6) Modak peda – This is nothing but the popular kesar peda shaped into modak. 7) Coconut modak – It is made from desiccated coconut and sweetened condensed milk. Then coated with chocolate. With this mixture you can make ladoo too. 8) Malai modak (paneer modak) – Only two ingredients are required, one is paneer and second is condensed milk aka mithai mate. 9) Dry fruits modak – Quick recipe where nuts, dates, raisins and dry coconut are grinded and mix, then shaped using modak moulds. 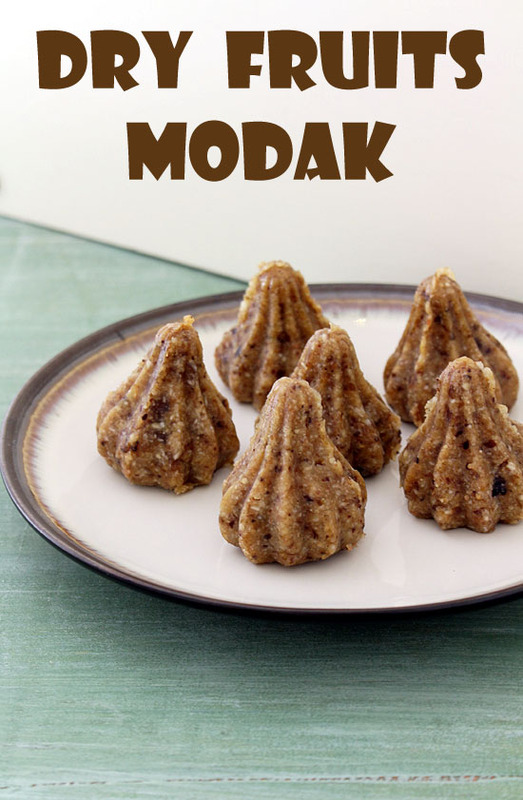 10) Til modak – A variation to usual recipe and made from sesame seeds and jaggery. After Modak, lord ganesha’s second most favorite food is ladoo. 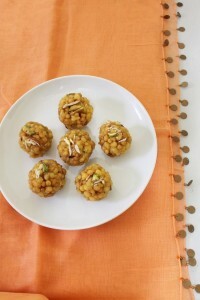 So many different versions of ladoo are made and served during this festival. Apart from modak and ladoo, few more traditional sweets are also made and offered to god which I have shared below. 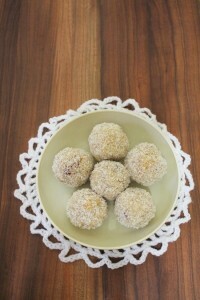 11) Coconut ladoo with khoya – Easy ladoo recipe made with desiccated coconut, mawa (milk solids) and powdered sugar. 12) Rava Besan ladoo – simple and easy laddu recipe made from semolina, gram flour, ghee and powdered sugar. 13) Boondi ladoo – Homemade boondis are soaked in saffron flavored sugar syrup and formed in ladoo shape. 15) Coconut ladoo with condensed milk – quick and easy ladoo made with only 4 ingredients (fresh coconut, condensed milk, cardamom powder and nuts). 16) Sheera or sooji halwa – the most popular Indian dessert made from semolina, clarified butter (ghee) and sugar. 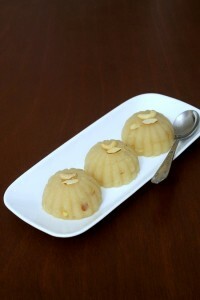 17) Banana sheera – similar to the sooji halwa but with the addition of bananas. It is made as a prasad for any kind of pooja. 18) Puran poli – stuffed Indian bread. Outer layer in made from whole wheat flour (atta) and stuffing is made from lentil-jaggery. 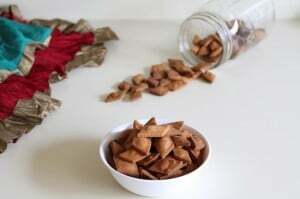 19) karanji – traditional Maharashtrian sweet snack recipe. It has sweet coconut stuffing with crispy crust. 20) Basundi – Sweetened and thickened milk with chopped nuts, flavored with cardamom and saffron. 22) shankarpali – sweet, crispy yet melt in your mouth textured, deep fried, whole wheat flour biscuits. Not only sweets but whole feast it offered to the god. The feast is served on banana leaf. The feast contains sweets, savories and panchamrit. 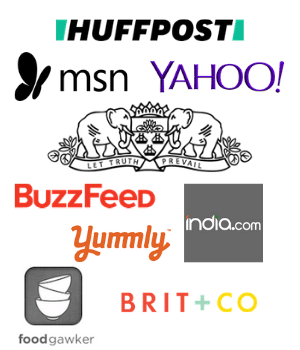 Below is the list of savory dishes from the blog. 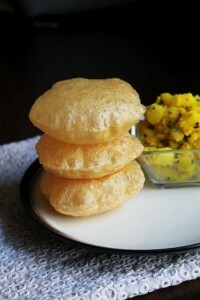 24) poori recipe – The popular Indian deep fried and puffed bread made from whole wheat flour, salt and water. 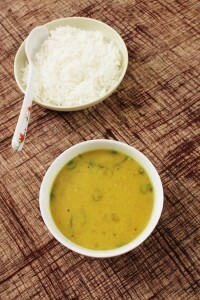 25) varan bhaat (maharashtrian style) – Healthy, delicious dal recipe made from toor dal and served with cooked rice. 26) varan bhaat (goan style) – simple dal made with toor dal and coconut. Also served with cooked rice. 27) moong dal khichdi – made with moong dal and rice with very minimal whole spices. 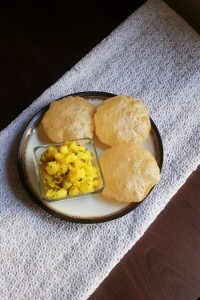 28) poori bhaji recipe – dry potato sabzi served with puffed pooris. This is popular Maharashtrian breakfast. 30) matki usal – made from sprouted moth beans, boiled potatoes and flavored with goda masala. 31) katachi amti – This is thin soup like made from strained water after boiling the dal and served with puran poli. 32) sabudana khichdi – made by sauteeing the soaked tapioca pearls with crushed peanuts and boiled potatoes. 33) sabudana thalipeeth – savory pancake made from tapioca pearls. This is also eaten during the fasting or vrat. 34) Batata poha – quick breakfast dish made from flattened rice with potato. 35) sabudana vada – made from tapioca pearls, peanuts and potatoes. Shaped into small discs and then deep fried. Very nice article Kanan. As we all know Ganeshji is very much fond of food and also known as Vrigodar, People make many tasty dishes to impress him on Ganesh Chaturthi. Modaks and Laddoos are among their favorite dishes. sankashti chaturthi or Ganesh Chaturthi is just a medium to try your hands on sweet dishes to serve as a prasad. You oresesnted a really good list, I am surely going to try some of them.